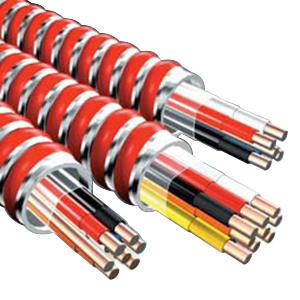 Fire 16/4 MC/FPLP Steel control cable in black/white/red/blue/red color, features TFN insulation to safeguard against electrical hazards. This copper cable has red-striped, interlocked galvanized steel armor. It has voltage rating of 300-Volts (FPLP) and 600-Volts (MC). It withstands temperature rating of 105 deg C (FPLP) and 90 deg C (MC) in dry conditions. This 250-ft cable comes in coil. It is suitable for remote control hook-up connecting main Fire control panel with pull stations, smoke detectors and alarms. Cable is UL listed.